Cooking fish can be tricky. It’s easy to worry about under-cooking it and then over-cook it by mistake. We cook some kind of seafood at least once a week, and yet so often I hesitate to say that the fish is done. I’ll offer my tips for cooking fish well in a later post. For now I want to share a recipe for salmon that is simple, delicious, and truly idiot-proof. Roast fish for about 10 minutes, basting with the sauce once or twice. (If the sugar in the marinade starts to burn, lower the rack.) And voila! The marinade keeps the fish so moist that even if you over-cook it a bit, it never tastes dry. Last night, as you can see from the photo, I served it over Udon Noodles with Soy-ginger sauce, a preparation that earned an A from The Professor. For a heart-warming winter meal, serve the salmon on a bed of leek and pea risotto. In the summer, I’ve served the salmon alongside Israeli couscous and grilled asparagus. For a lighter meal, it would be delicious served with a spinach salad. I love this salmon recipe because it’s simple to prepare, offers myriad meal options, and it is endlessly forgiving — which makes it great for dinner parties or even family dinners with multiple elements. I know that the salmon can sit while the pasta cooks a few more minutes or the asparagus is grilled or the guests are herded to the table and that it will still taste good. Tofu is a healthy source of protein, no doubt. It’s also the plastic of food products — it can be formed into just about any form, texture, and flavor from deli-like slices of “bologna” and “turkey” to soy pepperoni, soy chicken nuggets, and meatless ground beef. The myriad soy products out there constitute an impressive feat of food engineering, and personally, I love Tofurky’s Italian sausages and WildWood’s Spicy Southwestern Veggie Burgers. But would I serve them to The Professor? Not a chance. 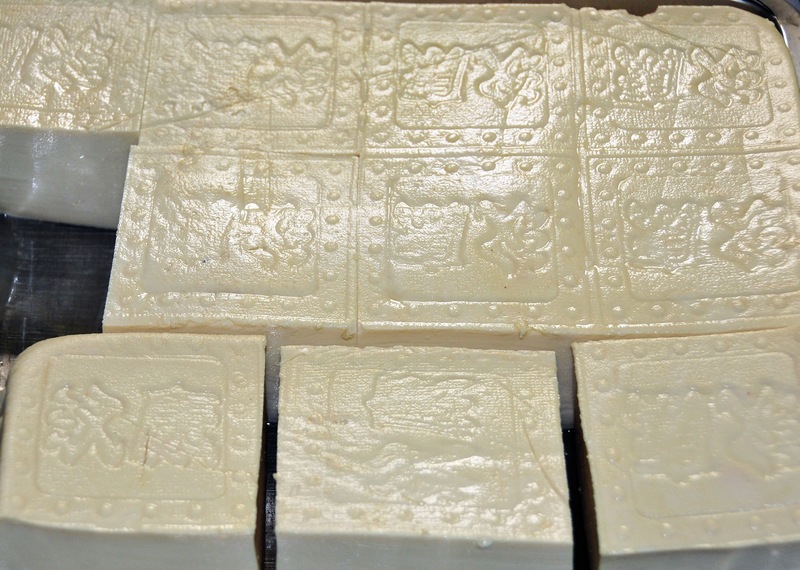 When it comes to meat-eaters, soy products masquerading as meat products are doomed to fail. So can you ever serve soy products to a carnivore? Yes, but only in two forms. First, the humble soy bean. Do you know anyone who doesn’t like edamame, as the Japanese call young soy beans? The Professor and my toddler will both gobble them down (and I plan to find or develop some recipes using the little green beans soon). 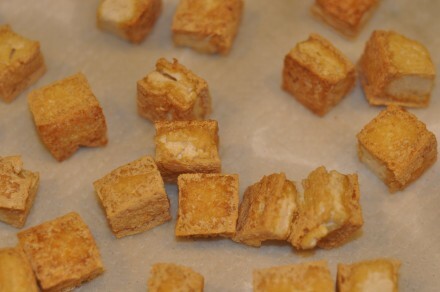 Second, as straight-up tofu — I recommend it cubed and fried, and buy it freshly prepared that way at my local Whole Foods. Now let me just say, I wouldn’t have served tofu for dinner if the Professor hadn’t suggested it as a possible addition to a dish he already likes: Udon Noodles with Soy-Ginger sauce. 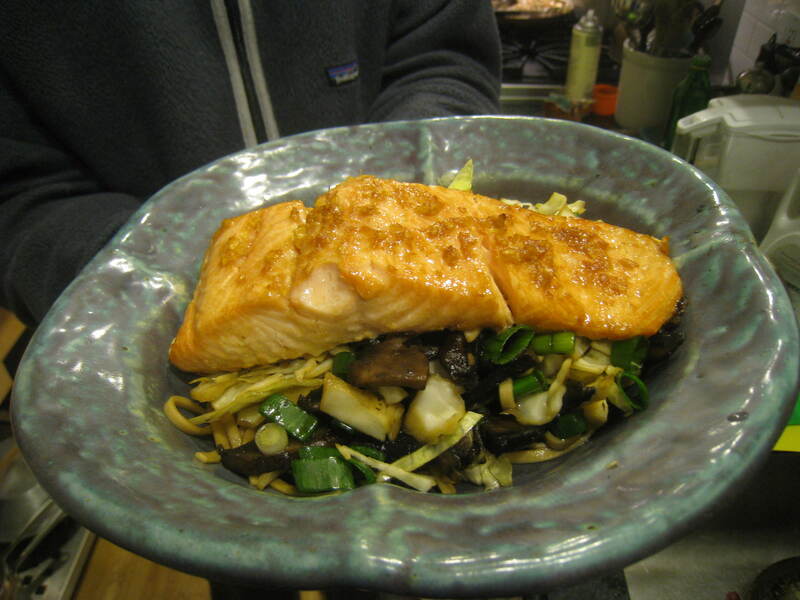 In the past, I’ve served it topped with salmon (a recipe I’ll share in my next post). But in the interest of creating a more strictly vegetarian version, and with The Professor’s permission, we tried tofu. When the oil shimmers add the garlic and ginger and cook, stirring frequently for 30 seconds. Push the mushrooms to the sides of the wok or pan, add the sauce and turn the heat to high. 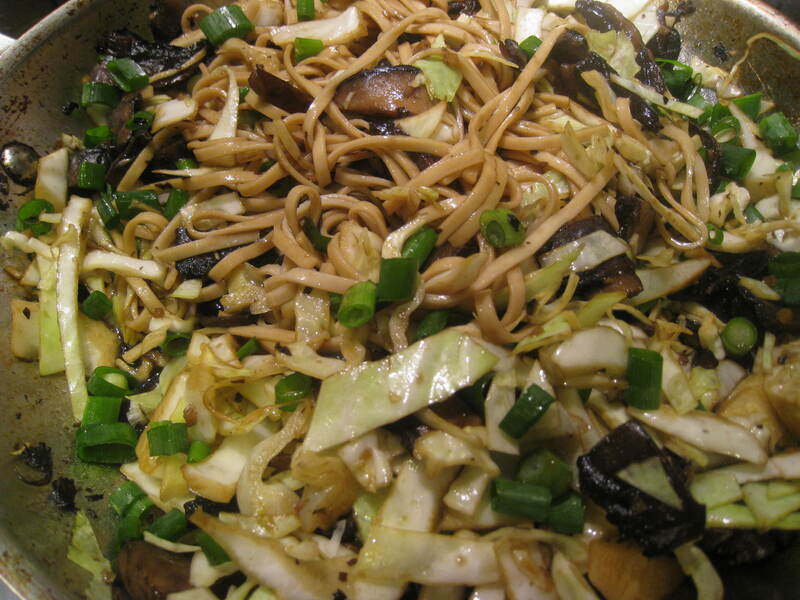 Add the noodles, the tofu, and the cabbage and toss until the tofu is warmed and the noodles are coated in sauce and fully cooked. Turn off the heat and mix in the scallions. Now, The Professor gave the noodles with tofu a B, in part because the cubes were a bit too big. But he welcomed a second attempt … more on that soon.